Love Monster is a red, hairy monster who is just trying to fit in with other Cutesville residents. But it’s hard to fit in with the cute and the fluffy when you’re a googly-eyed monster. 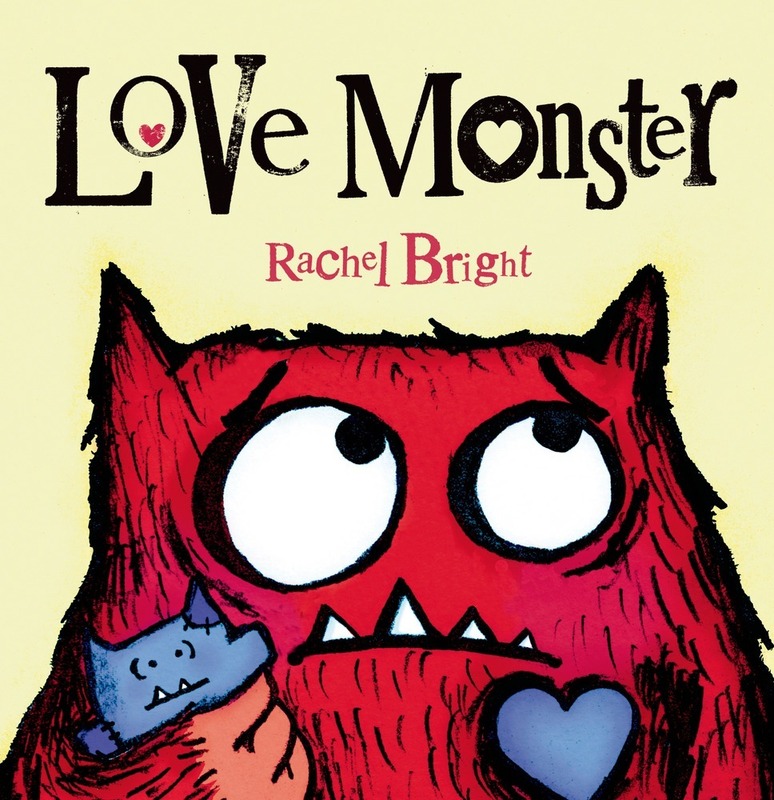 Love Monster ventures out to find someone who will love him just the way he is. His journey is not easy and he looks everywhere. But before he knows it, he realizes that love can find you when you least expect it. I don’t know about you, but my kids love to rip paper. There’s something about tearing things up that gets them so excited. Those giggles and grins are sure to put a smile on your face while you prep for making your new Monster. 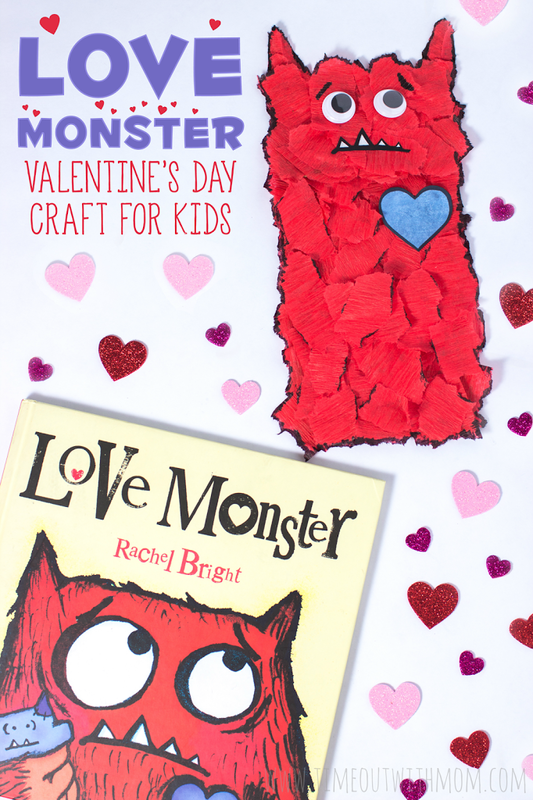 So go grab your supplies, get the kids tearing and get creative with your Love Monsters! Begin by tearing off pieces of crepe paper in various shapes and sizes. The kids can definitely do this, there’s really no right or wrong way. Just tear it up! Using a small amount of glue, add the crepe paper pieces along the top flap and bottom of your brown paper bag. Similar to how you would make a collage. Cover your dark spots from the glue with additional crepe paper pieces, adhering with tape or glue dots. I used tape, but the glue dots will save you quite a bit of time. Once your monster is covered, cut out two triangles for your monsters ears and cover them with crepe paper pieces as well. Be sure to make them long enough so you can attach them to the top of your monster. Tape or glue the ears down at the top of your paper bag. Attach your Monsters eyes with tape or glue. 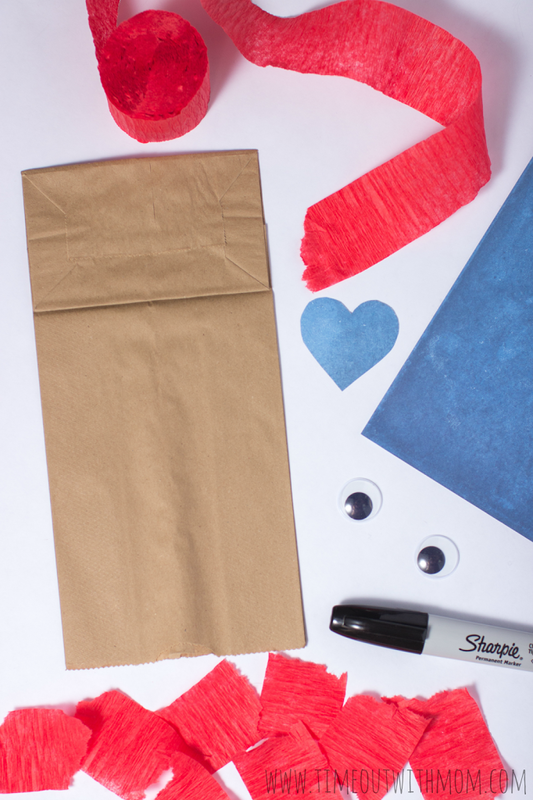 Don’t worry if you don’t have googly eyes, you can always make your own out of some construction paper. Cut out a mouth from scrapbook or construction paper and adhere it to your monster. Feel free to get creative and make a silly or happy face! Draw or cut a heart shape out of scrapbook or construction paper. I had a patterned page of scrapbook paper in one of my drawers, so I used that to give my monster some more texture. Using your permanent marker, outline your heart and adhere it to your monsters chest. Go ahead and give your monster some expression! Draw eyebrows on him and outline all along the edges of your crepe paper to create the black outline around his body. I added a few inside as well, just to give him some added texture so he would look really hairy. 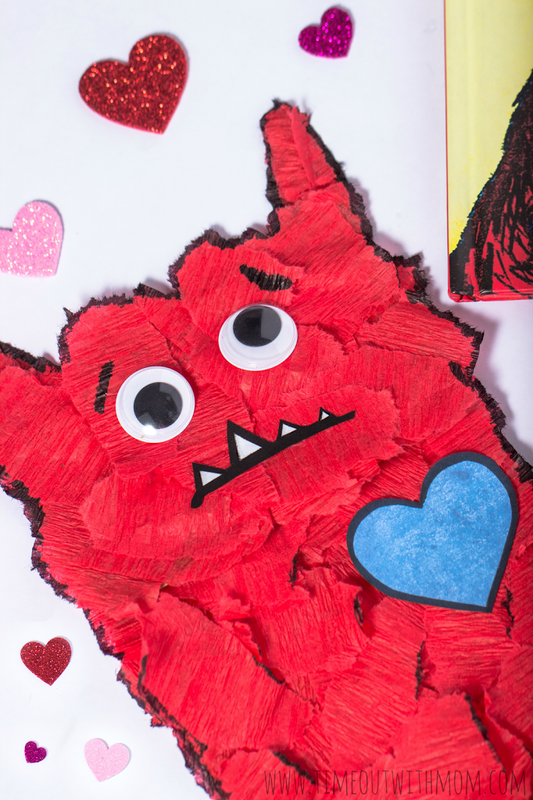 Finally, Read your book together and share some laughs as your Love Monster puppet comes to life and finds love this Valentine’s Day. I can’t wait to see what you create!